Established in the year 1996 at Jamnagar (Gujarat, India), we “Gayatri Metal Enterprise” are a Partnership firm, engaged in manufacturing, exporting and supplying of finest quality array of Brass Electrical Accessories, Brass Inserts, Brass Nuts And Bolts, Brass And MS Screws, Brass Studs, Turned Components, etc. 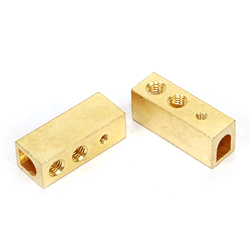 These brass products are highly-acclaimed for their sturdiness, high strength, precise design, and easy installation. We export these products to Gulf Countries, USA and Europe. Under the leadership of, “Mr. Jignesh B. Acharya” and “Mr. Dipen Shukla”, we have been able to meet bulk necessities of our patrons in efficient manner.